Many were surprised at Janet Napolitano’s announcement that she will leave her position as Secretary of the Department of Homeland Security (DHS) at the end of August to become president of the University of California. Chosen from more than 300 candidates vying for the position, Napolitano managed to keep her interest in that position, and her successful bid for it, from the public until Friday. I thank President Obama for the chance to serve our nation during this important chapter in our history. And I know the Department of Homeland Security will continue to perform its important duties with the honor and focus that the American public expects. Since day one, Janet has led my administration’s effort to secure our borders, deploying a historic number of resources, while also taking steps to make our immigration system fairer and more consistent with our values. And the American people are safe and more secure thanks to Janet’s leadership in protecting our homeland against terrorist attacks. Senator Jeff Sessions, (R-Ala.), saw things just a little differently: Napolitano’s tenure has been marked “by a consistent disrespect for the rule of law,” he observed. To the extent that terrorists have come into our country … across a border, it’s been across the Canadian border. There are real issues there. All of the 9/11 terrorists arrived in the United States from outside North America. They flew to major U.S. airports. They entered the U.S. with documents issued by the United States government, and no 9/11 terrorists came from Canada. One thing I’d like to point out is that the system worked. Everybody played an important role here. The passengers and crew of the flight took appropriate action. Within literally an hour to 90 minutes of the incident occurring, all 128 flights in the air had been notified to take some special measures in light of what had occurred on the Northwest Airlines flight. Napolitano either allowed or encouraged a “female sorority house” environment at the highest levels of her department that resulted in a federal discrimination lawsuit being filed by special Immigrations and Customs Enforcement (ICE) agent James Hayes which claimed her subordinates, Dora Schriro and Suzanne Barr, mistreated and sexually harassed him and other male staffers. When Hayes first reported the misbehaviors (beyond propriety to describe here) to the Equal Employment Opportunity Office, Napolitano launched a series of misconduct investigations against him. Soon thereafter Barr went on leave and then resigned altogether in September, 2012. The consequences of a prolonged economic downturn — including real estate foreclosures, unemployment, and an inability to obtain credit — could create a fertile recruiting environment for rightwing extremists and even result in confrontations between such groups and government authorities similar to those in the past. When challenged about those “findings,” Napolitano was forced to make numerous apologies and her department admitted to a “breakdown in internal processes” in creating the report. Our country is over $16 trillion in debt. Numerous examples of departmental cost overruns, schedule delays and performance problems cannot continue in this constrained budget environment. One is reminded of General Sherman’s March to the Sea where total war against Georgia citizens was waged in late 1864 in order to destroy Georgia’s economy. The obvious benefit of Napolitano’s departure for the University of California is that she may be likely to inflict less damage there than she did as head of the DHS. 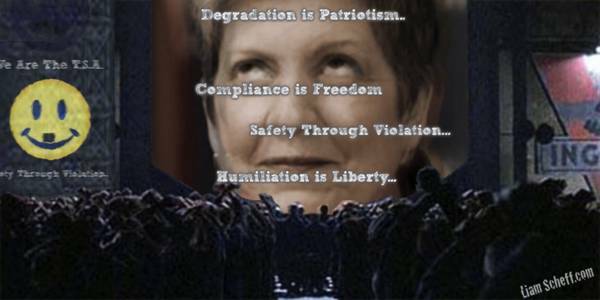 This entry was posted in Constitution, Human Rights Civil Liberties, Obama and Company, Privacy and tagged ammo stockpile, dhs, domestic surveillance, janet napolitano, police state. Bookmark the permalink.